The Challenges of the Legionnaires now starts ticking off a little earlier. Update: The official Anthem Twitter has now shared the patch notes, which wasn't the case at the time of writing. Original story: This first week of Anthem, where only PC players get to access the full game, seems to have acted like an Early Access period in fast forward. While a larger suite of changes are intended for Friday when the game hits wide release, including some load time improvements, some smaller tweaks are rolling out before then. That includes adjustments to the game's Challenge of the Legionnaires section, which sets mandatory objectives that players have to tick off in the game's Freeplay mode before the story can progress. Objectives like defeating 50 enemies with melee attacks, for example or killing nine elite enemies—there's a lot of them, and they take a while, delaying progress through the story. Before, the game wouldn't start counting progress towards each objective until you specifically reached the part of the story that opened up the challenges, but now Anthem will tick them off when you start exploring Freeplay from level 3. This should ease the amount of time it takes to work through them. While this change doesn't ditch the two worst objectives set by the Trials—having to revive your teammates a certain number of times, and the mandatory search for treasure chests—it should make this section less of a slog. 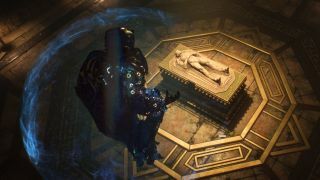 It's worth noting that the tombs were specifically called out by me and Tom as examples of poor design decisions in Anthem in our piece on the game's issues so far. It's encouraging that they're being addressed so quickly. Another positive change to the Challenges is coming on Friday—if anyone in your party opens a treasure chest in Freeplay, it'll count as the whole party doing so, according to a tweet by by BioWare's Michael Gamble. On Sunday when we played the game, the PC Gamer UK team was taking it in turns to open chests, before disbanding when we realised soloing would be a more efficient way of finishing the trials. Anthem's changes could be communicated a little better, overall. The game's official Twitter feed and BioWare's account don't mention anything about the changes coming on Day One (patch notes here), or these tweaks made so far—instead, individual BioWare staff are tweeting about them, which makes it hard to keep track of everything. Still, today at 1PM PT, BioWare's Ben Irving will livestream Anthem, addressing changes coming to the game and new content arriving in March. I'm having a complicated time figuring out how I feel about Anthem. The combat and exploration are genuinely fun, and I've really warmed to playing the game in Freeplay, even if there's not a lot of variety to enemy or objective types. The Javelins are lovely machines: beautifully animated, with a neat variety of abilities per mech. There's no denying it's a disjointed co-op experience, though, due to the story diversions in Fort Tarsis and pervasive loading screens. Hopefully, BioWare's patch this week will make a big difference.